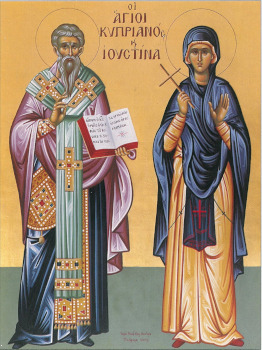 The Hieromartyr Cyprian, the Holy Martyress Justina, and the Martyr Theoctist perished at Nicomedia in the year 304. Saint Cyprian was a pagan, a native of Antioch. While still in early childhood he was given over by his misguided parents for service to the pagan gods. From seven years of age until thirty, Cyprian studied at the most outstanding centres of paganism – on Mount Olympus, in the cities of Argos and Tauropolis, in the Egyptian city of Memphis and at Babylon. Having attained to eminent wisdom in pagan philosophy and the sorcerer’s craft, on Olympus he was consecrated into the pagan priesthood. Having discovered great power by the summoning of unclean spirits, he beheld the very prince of darkness, and conversed with him and received from him a host of demons in attendance. Having returned to Antioch, Cyprian became revered by the pagans as an eminent pagan priest, amazing people by his ability to conduct spells, to summon pestilence and plagues, and to seance the dead. The mighty pagan priest brought many a human soul to ruin, teaching them magic spells and service to demons. But in this city there lived a Christian – the Virgin Justina. Having turned her own father and mother away from pagan error and led them to the true faith in Christ, she dedicated herself to the Heavenly Bridegroom and spent her time in fasting and prayer, remaining a virgin. When the youth Aglaides proposed marriage to her, the saint responded with a refusal. Agalides turned to Cyprian and sought his help for a magic spell to charm Justina into marriage. But no matter what Cyprian tried, he could accomplish but nothing, since the saint by her prayers and fasting wrecked all the wiles of the devil. By his conjured spells Cyprian set loose demons upon the holy virgin, trying to rouse in her the fleshly passions, but she dispelled them by the power of the Sign of the Cross and by fervent prayer to the Lord. Even one of the demonic princes and Cyprian himself, by the power of sorcery having assumed various guises, were not able to sway Saint Justina, guarded round about by her firm faith in Christ. All the spells dissipated, and the demons fled at the mere look or even name of the saint. Cyprian in a rage sent down pestilence and plague upon the family of Justina and upon all the city, but this was beaten back by her prayer. The devil thereupon flung himself upon the pagan priest who was in the process of repudiating him, and began to beat and strangle him. Saint Cyprian then first tested for himself the power of the Sign of the Cross and the Name of Christ, in guarding himself from the fury of the enemy. Afterwards, with deep repentance he went to the local Bishop Anthymos and consigned all his books to the flames. And the very next day, having gone into the church, he did not want to emerge from it, though he did not yet accept Holy Baptism. By his effort to follow a righteous manner of life, Saint Cyprian discerned the great power of fervent faith in Christ, and redeemed his more than thirty year service to Satan: seven days after Baptism he was ordained reader, on the twelfth day: sub-deacon, on the thirtieth: deacon, and after a year he was ordained priest. And in a short while Saint Cyprian was elevated to the dignity of bishop. The Hieromartyr Cyprian converted to Christ so many pagans, that in his diocese there was no one left to offer sacrifice to idols, and their pagan temples fell into disuse. Saint Justina withdrew to a monastery and there was chosen hegumeness. During the time of the persecution against Christians under the emperor Diocletian, Bishop Cyprian and Hegumeness Justina were arrested and brought to Nicomedia, where after fierce tortures they were beheaded with the sword. The Soldier Theoctist, looking upon the guiltless sufferings of the saints, declared himself a Christian and was executed together with them. Knowing about the miraculous conversion to Christ of the holy Hieromartyr Cyprian, a former servant of the prince of darkness and by faith shattering his grip, Christians often resort to the prayerful intercession of the saint in their struggle with unclean spirits.